Living in California, it’s hard to escape the Hollywood ideal that thin is beautiful. While thin is a good goal, you do not have to be a super-skinny celebrity to be healthy. In fact, if you’re overweight, losing 10 to 15 pounds, or 10 percent of your body weight, can have a major impact on your overall health. Carrying around extra pounds puts added stress on your body, which can take a serious toll on your overall health. An extra 10 pounds on your body adds 30 to 60 more pounds of force on your knees every time you take a step, leading to unnecessary wear and tear on your joints, chronic pain and fatigue. Having significant fat accumulation in your midsection, known as metabolic syndrome, leads to inflammation, increasing your risk for everything from diabetes to heart disease. If you are overweight, basic lifestyle changes make a big difference. In fact, just two to three weeks of healthy eating, exercise and stress reduction can have a major impact on your overall energy levels, regardless of the number on the scale. You’ll sleep better, feel better and wake up with more energy in the morning. If you are diagnosed with diabetes, studies show that losing an average of 23 pounds in the 18 months following your diagnosis improves your blood pressure and diabetes readings. Even better, this improvement lasts for up to four years after the initial diagnosis, regardless of your weight. And if you are diagnosed with sleep apnea, losing 10 percent of your weight can significantly reduce the severity of your sleep apnea symptoms. If you are struggling with weight loss 10 to 15 pounds can seem like an insurmountable goal. The good news is that it doesn’t have to be. Successful medical weight loss starts with making small lifestyle changes. Skip the drive thru, cook a healthy meal and take a walk after dinner. If you have a lot of weight to lose, talk to your doctor about weight loss surgery. 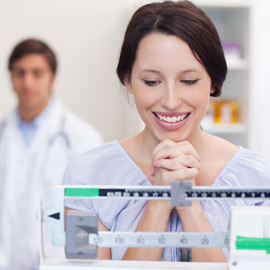 While weight loss surgery alone is not a complete solution, it is a great way to jump start long-term, medical weight loss.